The workshop “5G Security: Phase 1 landscape and foreseen evolutions” took place at Oulu, on 12 June 2017. EuCNC, 12-15 June, was chosen as the best venue to present the work of the Security WG after one year of activities. Pascal Bisson, technical coordinator of 5G-ENSURE and also one of the chairs of the Security WG, opened the workshop providing an overview of the working group. The main objective behind the workshop according to Pascal is to reach a view on priority security aspects of 5G network that is coherent and consistent across the 5G PPP Phase I projects. The result is the Security Landscape whitepaper launched on the occasion of the EuCNC workshop, produced with the co-operation work of several 5G PPP phase I projects. According to Patrick Donegan, HardenStance: This white paper looks like a must-read for 5G security folks. Caption - Collaborative work: 5G PPP Phase 1 Projects contributing to the White Paper on 5G PPP Phase 1 Security Landscape by the Security Work Group. Major 5G security risks and requirements as foreseen by the 5G PPP Phase 1 projects. The high-level Security Architecture for 5G network. Privacy: users, service providers and law enforcement. Trust aspects of 5G network. 5G faces a complex trust issue because of the different roles played by the stakeholders. 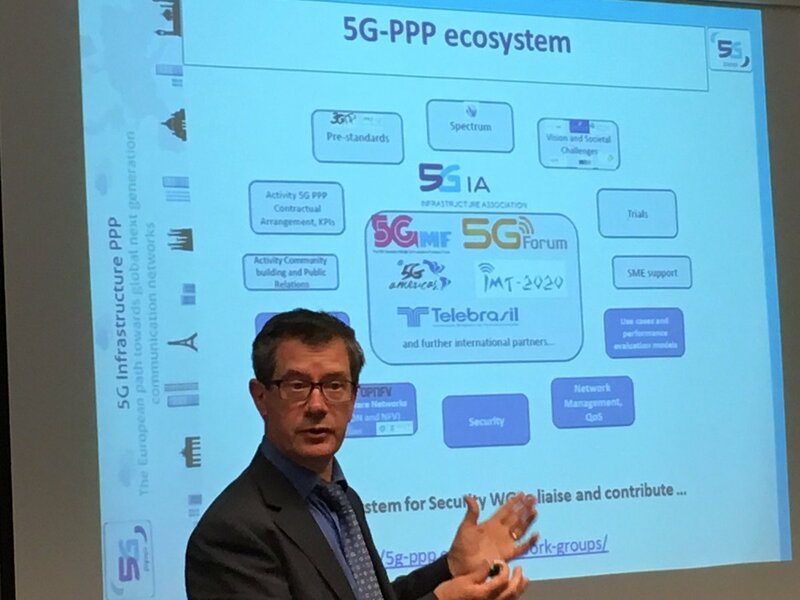 Pascal Bisson concluded the first session of the workshop indicating the next objective for the Security WG, which is ensuring further advances of the 5G Security Vision and also its realisation by taking advantage not only of the findings but also of assets coming from Phase 1 projects. Emmanuel Dotaro, head of ICT & Security labs at Thales Secure Communications & Information Systems, gave an interesting keynote on 5G and Security Transformation. The workshop panel discussion on “5G Security Perspectives” brought together key invited speakers as representatives from SMEs, manufacturers, researchers and verticals. Gabriele Rizzo explained the vision on 5G security as head of Strategic Innovation within Leonardo, where he is CTO, and also as professional futurist advisor to NATO ACT, and NATO expert for Cyberspace and Cyber Defence. Tommi Parnila, gave his perspective as Senior Security Consultant at Nixu cyber security company. Raimo Kantola provided his view as professor of Networking Technology at Aalto University, Communications and Networking, in Finland. Olav Queseth provided his perspective as both researcher at Ericsson and project leader of the METIS-I and II projects. Full report on the workshop outcomes and exhibition stand is available here.